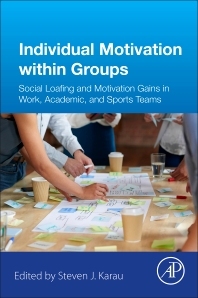 Individual Motivation within Groups: Social Loafing and Motivation Gains in Work, Academic, and Sports Teams explores the state of our scientific understanding of when and why individuals are most and least likely to work hard as members of groups and work teams. This book addresses key psychological phenomena such as social loafing, social dilemmas, social facilitation, and ostracism, with each chapter creating connections to related topics such as leadership, performance in learning groups, isolated teams, and more. This volume provides a summary of the field’s history, synthesizes related research, and, using the Collective Effort Model and other key motivational theories, looks at the current level of understanding of both motivation losses and gains in groups. Individual Motivation within Groups is a vital resource for social, organizational, and applied psychologists as well as academics and researchers in these fields and related areas such as leadership and team performance. Steven J. Karau is a management professor at Southern Illinois University, teaching courses in organizational behavior, human resources, and social responsibility. He conducts research on a range of organizational behavior issues, with a special focus on motivation within groups, team performance, personality, and ethics. He has published more than 40 articles in a variety of top psychology and management journals and co-developed the Collective Effort Model of individual motivation on group tasks, and Role Congruity Theory of prejudice toward female leaders. His research on social loafing was featured on an episode of ABC News’ 20/20.